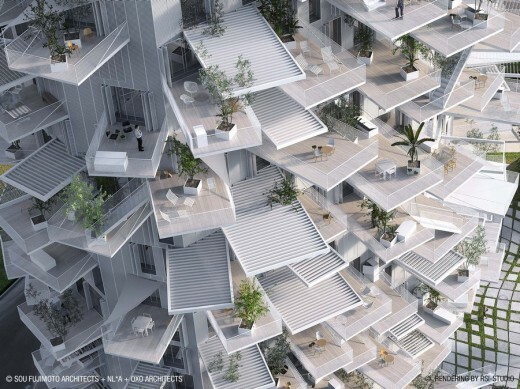 The architects Sou Fujimoto Architects + Nicolas Laisné Associates + Manal Rachdi Oxo Architects associated to the developers Promeo Patrimoine + EVOLIS promotions, have won the competition for the construction of the second “Architectural Folie of the XXIth century” in Montpellier. 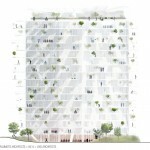 The multidisciplinary team includes Sou Fujimoto Architects, Nicolas Laisné Associés, Manal Rachdi Oxo Architects, engineer André Verdier, environmental engineering agency Franck Boutté Consultants, landscaping team Bassinet Turquin, designer Lumière Studio, and inspection firm Socotec and Casso et Associés. It was picked to design the 10,000 m² mixed-use tower to accommodate a housing programme, restaurant, art gallery, panoramic bar and offices. 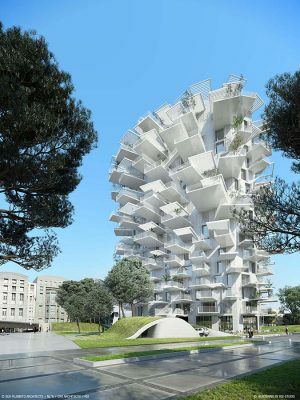 The new multipurpose tower called Arbre Blanc (white tree) is designed for housing, a restaurant, an art gallery, offices, a bar with a panoramic view and a common area. 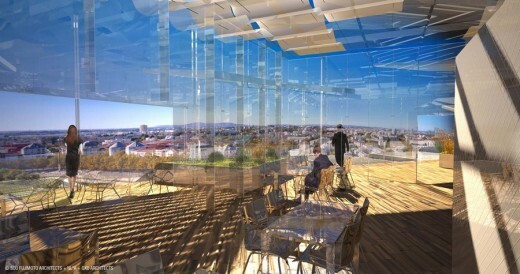 From the project’s concept phase, the architects were heavily inspired by Montpellier’s tradition of outdoor living. 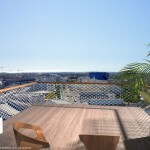 The tower is strategically located between the city centre and the newly developed districts of Port Marianne and Odysseum, midway between the “old” and the new Montpellier. It is also situated at the crossroads of several thoroughfares: the Lez River, the motorway and the pedestrian/cycling path along the banks of the octroi de Montpellier, or land grant. 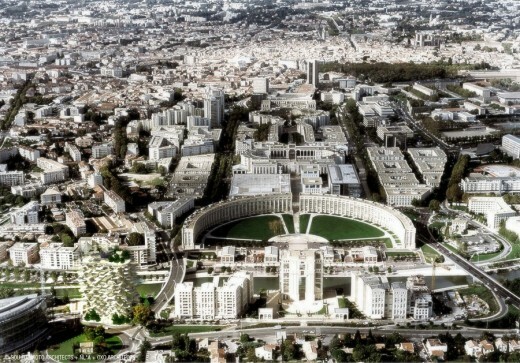 The project will kick off with a grand gesture to extend a landscaped park along the Lez and stretch out the length of Christophe Colomb Place. The eastern face curves along the edge of the roundabout while the western side on the Lez is convex to create the widest panorama possible. The curvature serves two purposes because this part of the facade offers the best exposure and viewpoint but does not block the view for neighbouring residences. 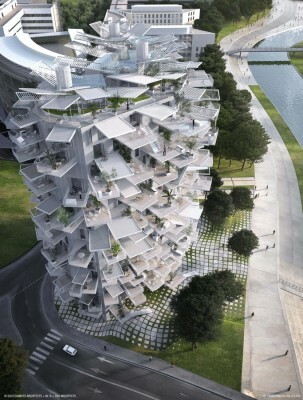 Despite the name “white tree,” this is by no means an ivory tower. 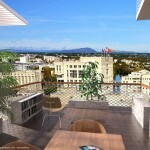 A beat integral to the urban song, the building is destined as a public high-rise built for every soul in Montpellier. 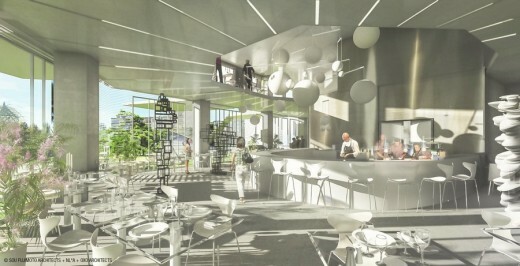 The edifice will extend its limbs to all the city’s residents and visitors, from the ground floor restaurant and art gallery to the penthouse bar serving as vista point. This attainable passage will make the tower that much more attractive as a source of pride for Montpellians and a point of interest for tourists. Of all people, the building is unavoidable for its inhabitants, so a common space has been added on to the public bar where all the co-owners from any floor can have a private taste of the scenic view. 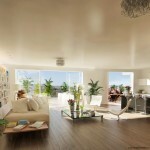 Spaces in the flats know no difference between inside and outside – you are free to move through them instinctively. The balconies are proportioned to make you gravitate toward the outdoors, like leaves fanning out to soak up the warm nourishing sunlight. The architects sought to encourage free-choice architecture, which they see as underpinning tomorrow’s housing trend where everyone starts with a “housing stock” when they buy their flat and are not confined to manufactured articles, regimented layouts, turnkey spaces. Instead they are given possibilities, modular interior spaces they can choose from a catalogue of optional features and floor plans. Just like a tree, the tower will feed off its locally available natural resources to drastically reduce the energy it needs to expend. It will devise passive strategies to induce comfort and use as well as control environmental impacts and scale back emissions. 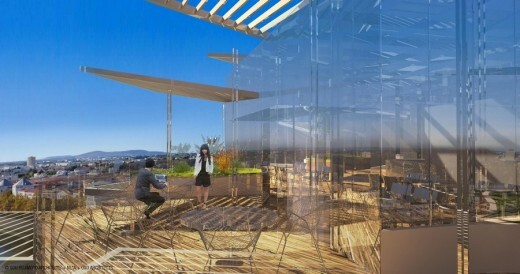 An unconventional yet dialectical process will passively cool units with solar fireplaces. 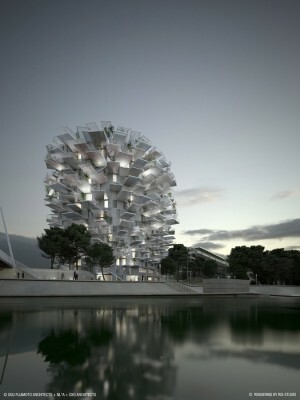 Arbre Blanc is the tallest “Folie” in Montpellier’s architectural arsenal and is looking become the city’s focal point, a landmark that serves as a lighthouse or guiding star at night amid the regional urban skyline. 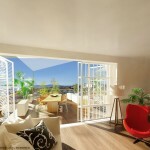 An exclusive outlook on the surrounding area, a gift to all the city’s residents and visitors. A starting point from where the vista branches out and your eyes can take it all in: the land’s silhouettes, the open water, the longing it creates for far-off lands and Montpellier’s rich historical heritage. Erected in a pivotal location for the city, at its core Arbre Blanc is the very symbol of the Mediterranean, the “mid-land sea” that has forever been a crossroads, a meeting point between Europe, Africa and Asia. 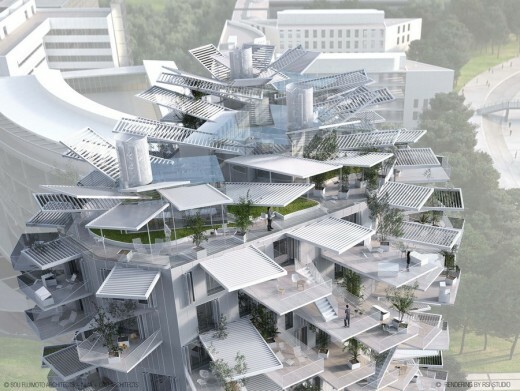 Perspective: RSI studio, Manal Rachdi Oxo architectes. Nicolas Laisné associés.